When is Evo 2017 and What is the Twitch Stream Schedule? 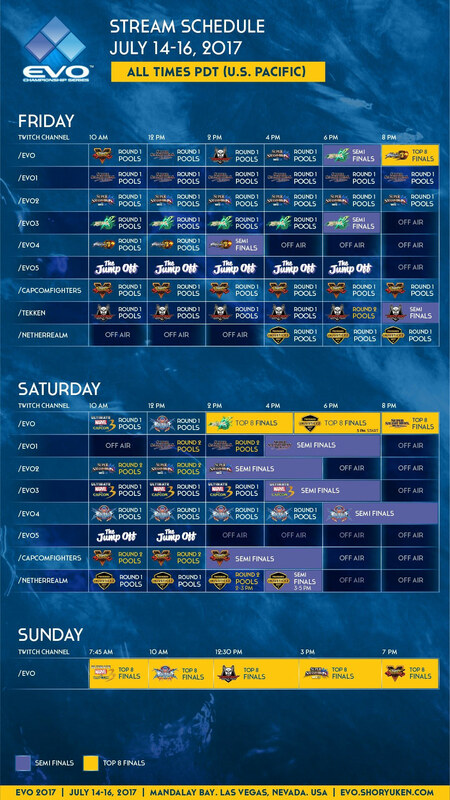 Find out when Evo 2017 is and what the stream schedule looks like. The Evolution Championship Series (Evo), which represents the biggest and longest-running fighting game tournaments in the world, brings together the most skilled players from some of today’s most popular fighting games. This event will dominate Twitch when it’s on, but some fans are struggling to figure out when Evo 2017 takes place, and what the Twitch live stream schedule will be. Well, Shacknews will be attending the event, so we have you covered. Evo 2017 takes place from July 14-16, 2017. The event will be held in Las Vegas, Nevada, with the festivities taking place at the Mandalay Bay Resort and Casino, which explains why the UFC doesn’t have a PPV there this weekend. In terms of a specific schedule, Event Hubs has an amazing infographic that breaks down every detail of the various tournament schedules, including what channel they’re on, when the broadcast begins, and what games will be featured. There’s also lots of information on Evo 2017 on the official website in the form of an Evo FAQ. Fans can read up on details of how to attend in person or watch online, and players can find information about the various tournament rules and regulations. For now, though, at least you know when Evo 2017 is and how to watch all the action on the Twitch streams. You can also visit the Shacknews Evo 2017 page to read up on all our current and future coverage. Bill Lavoy posted a new article, When is Evo 2017 and What is the Twitch Stream Schedule? can't wait to see the action. WHen's marvel? Bill bill bill bill lavoy the video game guy. who is my daddy and what does he do? Obligatory reminder that there's an active shackfighter steam chat if you want to shoot the with us (or play games). How does one find this chat? I'm clueless about steam's social features. Any shackers attending this year? I'm going again after a three year hiatus.